A newly discovered patent, "Notifications on game controller," has gaming controller watchers asking the questions this week: Could we be looking at the controller for Google's planned game streaming service? Is this pretty much the design that is in the works? The patent applicant was named as Google LLC in Mountain View. The funny thing was that the patent was not focused on the controller but on a notification system. Nonetheless, the patent included some renderings that could indicate how the system would work. Eager eyes pored over the illustrations, to predict whether or not this was what Google had in mind as a console. The patent is all about a notification system that operates between gaming controller and gaming system. Questions ran in several directions: What kind of console is this? How will it figure into the Google streaming service? Will the upcoming developer event carry a surprise revelation about one of these two questions, or both? The patent might expose, at the least give good clues for, what Google has in mind for hardware in Project Stream. "The rumored Google gaming console is known as Project Yeti, which aims to run high-performance titles on Google's machines and then stream them to devices owned by players. Part of Project Yeti is Project Stream, which ended a three-month demo in January that successfully streamed Assassin's Creed Odyssey on Chrome browsers." In Project Stream, the one game available was "Assassin's Creed Odyssey." David Nield, TechRadar, in addressing the patent talk, said, "You can play it with either a keyboard and a mouse, or an attached controller, but this patent is the first look we've been given at some potentially Google-branded devices that might accompany the cloud gaming service." This patent discussion was given close attention by Yanko Design (via Twitter), and proceeded to come up with "a visualized concept" based on Google's patented design. So, it must be kept in mind that this is a visualized concept. In a patent. Not to be confused with a photograph in a real-life product plan. Details based on the images were 2 joysticks, directional pad and buttons including on the shoulder. Aaron Mamiit, Digital Trends, said there appeared to be "home and back buttons at the top part of the controller, a circular button that Google referred to in the patent as an action button, and microphone button in between the joysticks that may hint at compatibility with Google Assistant." The eye-catcher was a voice control button in the center. Maybe, Nield said, that is for calling upon Google Assistant while the user is in the gaming session. What's next? You may hear more about this patent discussion via the Game Developers Conference later this month. Abner Li, 9to5Google, said that "Google is expected to announce its game streaming service codenamed Yeti." Google is hosting an event and guesses are that it may revolve around a streaming service. Li called the patent showing "Google's take on a new game controller at the center of a multi-screen playing experience." "The patent itself is for a notification system for the controller that notifies a player when a game is now available, that a user has received an invitation, a status chance on a leaderboard, or a chat request from another player," said Andrew Liptak in The Verge. The game launched on the host device responds to an activation signal from the game controller. "The host device may be, for example, a tablet, a smartphone, a TV connected to a game system, etc. The host device may have the hardware and software necessary to cause display of a video game, electronic interaction (email, chat messaging, invitations, web browsing, etc. ), and/or application upon execution of instructions stored on computer readable media of the host device," according to the patent. 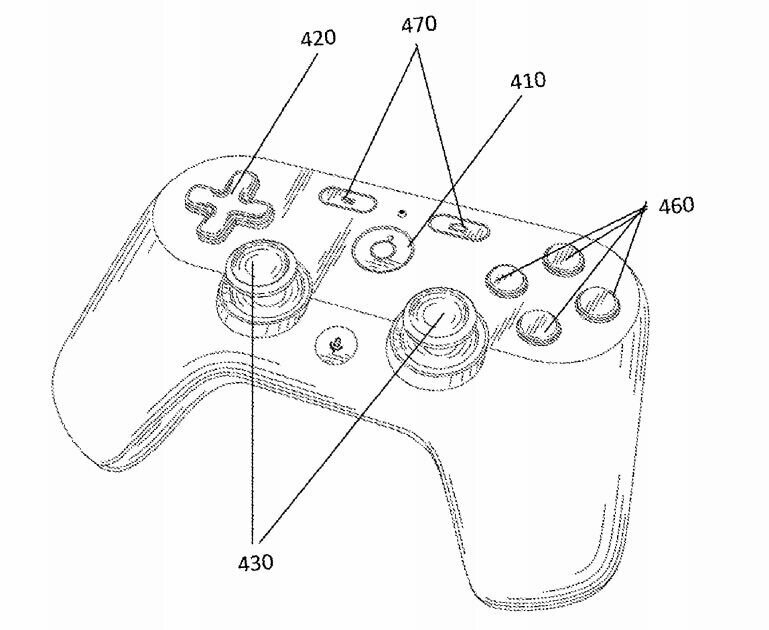 JC Torres, SlashGear, meanwhile, noted that "The patent itself is just as interesting as the controller it reveals." Torres pointed out that It talks about notifications received on the controller, "possibly conveyed via haptic feedback. A lot of the language seems to be geared towards a client-server system that sounds a lot like a game streaming system." A few comments from readers on tech watching sites were expressions of worry and doubt: "How seriously will they [Google] take this? Game consoles are a long-term investment." Another reader reaction was that "the console war is a very tough one." One thing is certain; interest will continue on what Google plans in the gaming area.